Paper Daisy Crafting: In colors - get ready to say goodbye. In colors - get ready to say goodbye. Today I'd like to talk to you about In Colors. Do you know what they are? In Colors are a set of five core colours which stay for two years in our collection and then change to be replace by five new colours. As we approach the new catalogue, due out in June, we will be saying a very fond goodbye to the 2017 - 2019 In Colors. 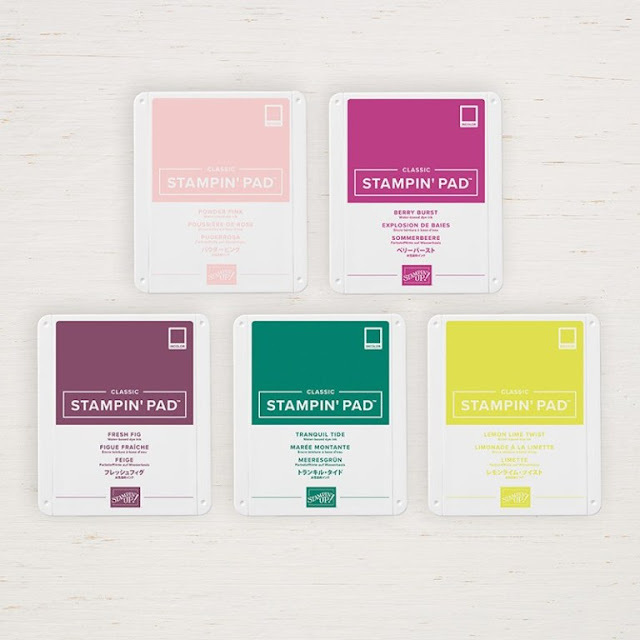 The colours that will be leaving are Powder Pink, Berry Burst, Fresh Fig, Tranquil Tide and Lemon Lime Twist, which means the ink pads, refills, ribbons, cardstock and all other products that go along with them will be disappearing. The reason I’m letting you know now rather than with the ‘official’ retirement day is that usually as soon as the retirement list gets announced, which will be very soon, these colours are the first to go and usually last just days. So if any of these colours are your favourites, now is the time to get them ordered.